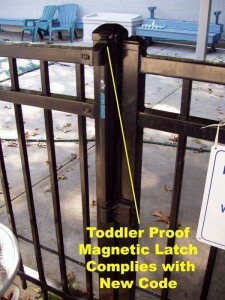 Child safety fencing can save a life. Child safety fencing is often installed on residential property to act as a barrier around residential swimming pools for one simple reason—to keep children safe. A swimming pool can be a very dangerous place for your children, grandchildren, other family relatives and neighborhood pals. From small infants to young adults, drowning has become one of the leading causes of death for those 1-19 years old. To prevent this from happening, a simple pool fence construction can help keep your children and other young swimmers safe and sound. While adult supervision is always suggested to watch children in the pool, child safety fencing is an extra precaution to have surround your swimming oasis. Child safety fencing for a swimming pool is built to separate the pool from the home. These particular kinds of fences have four sides, are typically four feet high and have self-closing and self-latching gates that open outward. The latches that are out of reach of children. Proper Height: While it was mentioned earlier that pool fences are usually four feet high, child safety fences should be a minimal three and a half feet and, at most, six feet high. It is common knowledge that a shorter fence is more adequate for toddlers while taller and elongated child safety fences are more equipped for adolescents. Durable Construction: Child safety fences are sturdy and can be removed from your property or find themselves a home forever. It is important that the fence resists all types of weather, more importantly the Maryland winter, and is not subject to damage. Sturdy materials like metal are oftentimes purchased because they can withstand pool chemicals, harsh weather and are extremely resistant to rust. Latching Gate: A self-latching gate is considered to be the most critical element of child safety fences. The gate should swing shut and latch properly to prevent children from entering the pool area via an open gate. Ideally, the latch should be out of reach of small children and a combination lock or padlock can serve as an additional safety feature. Bar and/or Mesh Placement: The majority of the fence should be constructed to prevent children from slipping through the fence bars and/or or climbing the mesh to enter your pool. The bars in your child safety fence should be placed no more than four inches apart from each other. Likewise, mesh openings should be no bigger than one and a half inches across. Are You Ready to Talk to Someone About Your CHILD SAFETY FENCE?